Don’t even try it. Put away your lab equipment. Stop brewing strange liquids in beakers. Stop dissecting poor, defenseless pickles. Unless you have a super-genius mind like Rick Sanchez, the very idea of transforming yourself into a pickle is quite preposterous! Actually, the idea of transforming any human being into a pickle is kind of preposterous, but that’s beside the point! Who even knows what sort of gadgets and biochemistry had to be mastered to create such a feat? You’ll just have to be satisfied with just being a plain-old, normal human being. Sorry there, Buster. Nah, we’re just joking. You can totally become a pickle version of yourself, just like Pickle Rick from Rick and Morty. You just need this officially licensed costume! This Rick and Morty Pickle Rick Inflatable costume comes with everything you need to become the pickled version of your favorite mad scientist. The green suit has printed details on the exterior, fully creating the illusion of pickle bumps. The top of the suit has Rick’s face printed on it, along with his glorious unibrow. The mouth has a clear visor for vision. Of course, the best part of this costume is the inflating function. It comes with a small motor and fan that keeps the costume inflated while you get into all sorts of Rick and Morty style shenanigans. Hey, stop fiddling with your science gear. You don’t need to craft a process for turning yourself into a pickle anymore. 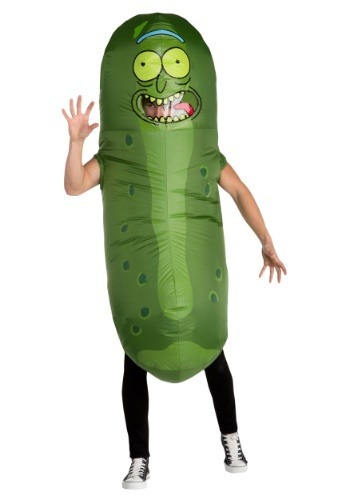 You have the answer right here with this Pickle Rick costume. Just be wary of any rats you encounter while wear this costume… they are not your friends and they will most likely summon an army of their friends to do battle with you. Be prepared.